We are headed to the city this morning for a beautiful wedding in Washington DC! Emily and Jacob held their sophisticated and elegant wedding ceremony inside the grand National Museum of Women in the Arts in downtown Washington, DC. The pair wed with their family all around, and plenty of family elements in the wedding ceremony, including a very special guest serving as their officiant and even a token above them to represent family no longer with them. Once the bride and groom found this unique and iconic DC wedding location and they knew it was “the one.” With the beautiful artwork and incredible architecture of the museum, there was little need for much more of a wedding theme with such a special backdrop behind them. So, they kept their wedding decor it clean, classic, and personal, of course. 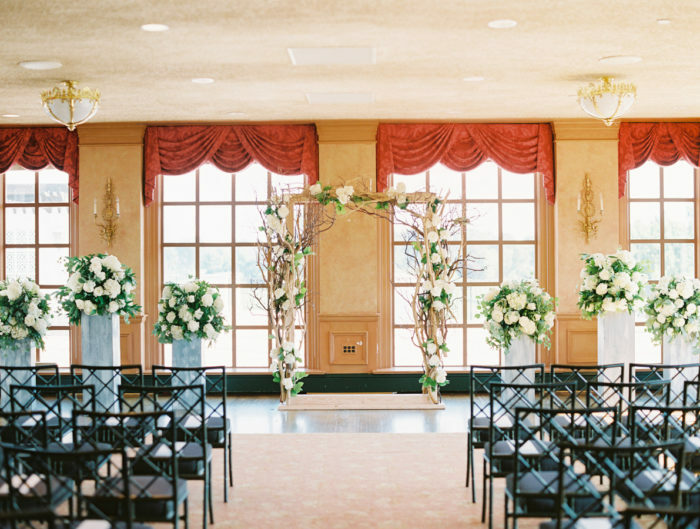 Emily and Jacob said “I do” under a beautiful Huppah rich in color that we just adore! Special thanks to Jessica Schmitt Photography for sharing Emily and Jacob’s beautiful Washington DC wedding ceremony with us! 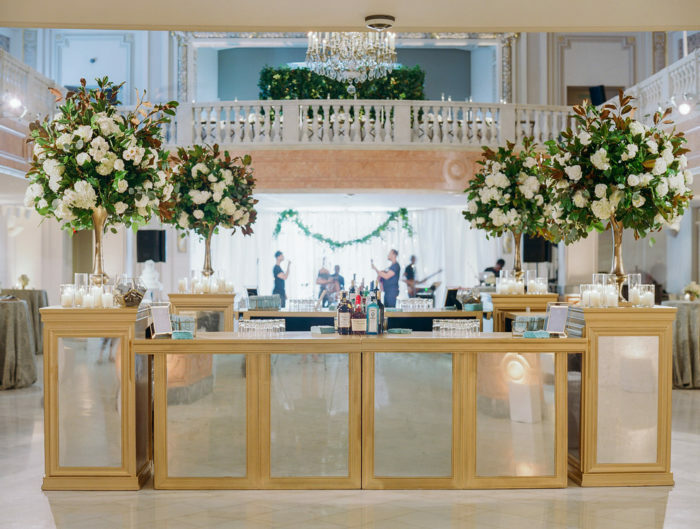 From the bride: We didn’t have a wedding vision in mind, but when we found our location — the National Museum of Women in the Arts — the “look” quickly materialized. We settled on classic, modern, and understated decor in order to compliment and not overshadow the beautiful paintings and architecture of the building. I spent a lot of time on Pinterest, which helped narrow our ideas and provide our wedding vendors with specific suggestions. We hung Jake’s grandfather’s tallis over the huppa, which was an extremely special way to incorporate religious tradition and family no longer with us. One of my favorite parts of the ceremony — officiated by one of Jake’s brothers — was having our family come up and recite the seven blessings. It allowed us a tiny, personal moment with each of them. Toward the end, Jake’s childhood friend Noam sang a prayer and played the ukulele, adding a welcomed element of levity. On a frivolous level, I loved getting in the taxi to go to the venue in my beautiful dress and feeling like a bride, realizing this was my big day. On a serious note, I loved the unity and partnership of going through the ceremony and the party with Jake by my side. Being surrounded by our friends and family — all of whom were nothing but happy for us — was also a wonderful feeling that cannot be overstated. Congratulations to Emily and Jacob! 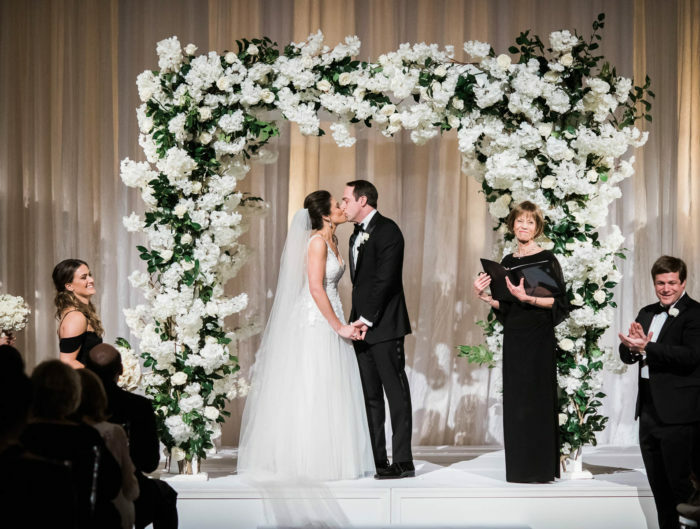 Thank you for sharing your gorgeous Jewish wedding ceremony in a museum with us! Stay tuned, up next we’re going to show you their swanky, white wedding reception. Love this wedding! Great venue and the chair set up is awesome!